A Nobel Prize-winning author has been added to his country's second-largest bill. 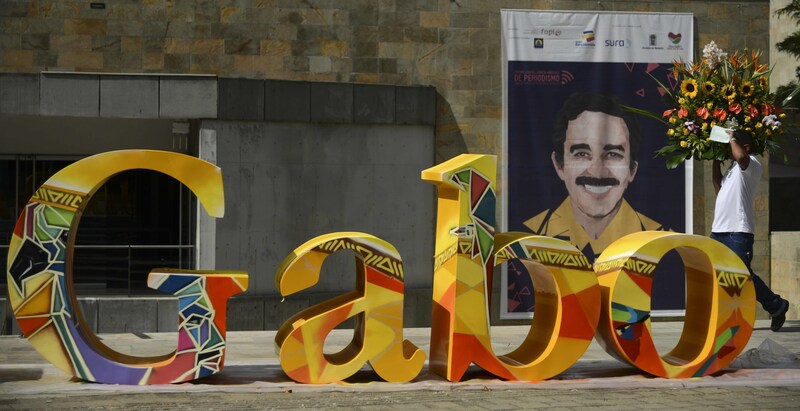 Gabriel García Márquez now appears on Colombian banknotes, which were put into circulation "last week, following an official ceremony in Bogotá." García Márquez died of pneumonia in 2014 at the age of 87. The bill bearing the Love in the Time of Cholera author's mug is worth 50,000 Colombian Pesos, roughly $17.43 U.S. The note also features images of two members of Colombia's indigenous Arawak tribe and La Ciudad Perdita, a ruin in the Sierra Nevada. The 50,000-Peso bill shows García Márquez — affectionately known as Gabo — releasing a cloud of butterflies into the air. It's a reference to Mauricio Babilonia, a character in One Hundred Years of Solitude, who is always accompanied by a swarm of yellow butterflies. After the author's death in 2014, García Márquez's fans left strings of paper butterflies outside his home, and fans in other countries laid them wherever his ashes were placed on display. García Márquez isn't the first author to appear on a banknote. He joins ranks with Hans Christian Andersen, Murasaki Shikibu, James Joyce, and Charles Dickens. In 2017, Jane Austen will become the next high-profile author to appear on her country's paper money, when she makes her debut as the face of the U.K.'s £1 0 note.